Trading card collection of 14 different images of Bigfoot-Inspired art that was featured in the Running With Bigfoot art show held in California in April 2014. Each card features art by 14 different Artists. This set was produced to continue to help benefit the Bigfoot Discovery Museum in Felton, CA. Kepi and his friends have donated use of their images and have each signed a limited number of Artist Autographed cards! 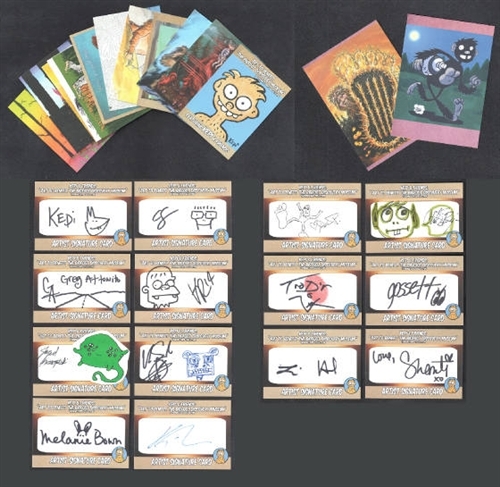 These artists personally signed Autograph Cards: Kepi Ghoulie, Kevin Seconds, Dan P., Greg Attonito, Shanti Wintergate, Chris Shary, Lori Herbst, Kori Thompson, Melanie Brown, Christine Benjamin, Trad'r DonV, Jared Konopitski, Gilbert Armendariz & Bruce Gossett. Deluxe Set: 12 Standard cards, both bonus art cards and 1 random autographed card *Autographed cards are each unique hand-signed by each artist. No two cards are alike. Not all artists doodled on their cards. Cards pictured are just a sampling. Signed cards are selected at random.